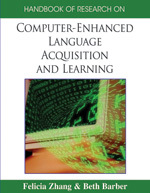 This chapter presents a descriptive report on a video chat project undertaken in early 2006 at the University of Canberra, Australia using iChat. Video chat enables two or more people with personal computers and broadband Internet connections to ‘chat’ with audio and video so they are visible to each other, in real time, almost as though in face to face communication. This project aimed to provide L2 learners opportunities to practice speaking with and listening to native speakers of the target language and experience real-life communication in the target language. The report contains a detailed account of the methodology and observations made on student behaviour and motivation during the project. Students participated enthusiastically in the project and seemed to be highly motivated to use iChat to communicate with native speakers of Japanese in Japan. The project showed that there is great potential for video chat as a language learning tool. iChat: Consumer Internet video conferencing software, which enables two or more people to talk to and see each other in real time as though face to face, written for Macintosh computers. Podcast: A method of publishing files to the Internet, usually audio or video files, allowing users to receive new files automatically by subscription. Audio-Based CMC: CMC based on audio communication. Internet telephone, such as Skype, is considered to be audio-based CMC. Audio-Visual CMC: CMC based on video plus audio, so that both audio and visual information is available. Internet video conferencing and video chat are forms of this type of communication.